Eli is feeling better. The throwing up as stopped and slowly he is getting his appetite back. But boy, I'm tired! At 12:30 yesterday I had to pick up Sara from summer school. Eli and I packed up ourselves and the "just in case bowl" too. While driving I thought - let's go out to eat. I deserve it - this past day has been rough. The thought passed and my new and improved frugal mind kicked in - I'm so close to the end of the month - to the end of our No Fast Food Month . Problem was, I had a real craving for a good burger. So I made one at home instead - with what I had on hand. 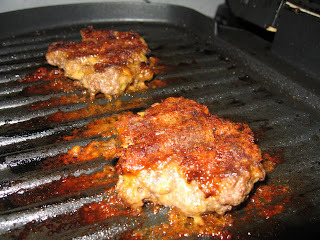 The burgers were made simply with ground beef, garlic salt and cheddar cheese. 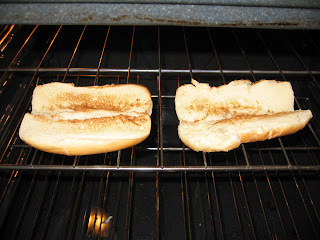 I had no hamburger buns - but hotdog buns worked just fine. While the burgers were cooking I picked these cucumbers from the garden! Yeah!! This is my first time ever eating something that I grew. Yum! well done, Dana! 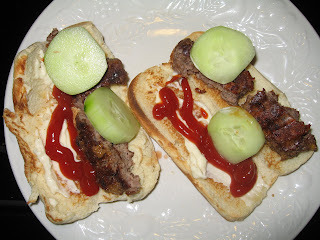 The burgers look really good and that important addition of the cucumbers is very special. I hope these cucumbers are just the first of many. Congrats on resisting the fast food stop. The toughest part is changing your spending habits. You did well and the burgers look like they turned out great! You did it! Good job overcoming the temptation. You totally deserved something better than McDonalds. The burgers there are nowhere near as good as the ones you made. Good for you. And your burger tasted better than any you'd get at a drive thru.